"How to ACE a Group Interview, Beat-Out Your Competition, and Land the Job!" If you have a group or panel interview coming up then I want to show you how to pass it with flying colors. I'll get you prepared for your group interview so you stand out as the smartest candidate in the room. Most people confuse panel interviews with group interviews, but there’s BIG a difference, and when you watch me in the video above, I'll explain both types of interviews and the different strategies you need for each one. Group interviews are a new style of interviewing employers have adopted because they’re highly effective at weeding out weak candidates. Group interviews give employers a unique opportunity to see how you respond in a simulated work environment. Most job seekers have never been on a group interview, so they have no idea how to act or what to expect. And this makes preparing for a group interview very difficult. With traditional one-on-one interviews, you know what to expect. Sure, you might be a little nervous at first, but you’ll ease into the interview because you’ve been on a similar interview before. But since group interviews are so new, it’s difficult to find any strategic advice or helpful information. Let’s face it, going on a group interview for the first time is like walking in the woods, all alone, in total darkness, without a flashlight. You have your hands out in front of you the whole time, making sure you don’t run into anything. You’re nervous. You’re anxious. You’re scared. You don’t know what to expect next. They stick you in a room full of other candidates with a panel of interviewers and expect you to perform. They drill each one of you, round-robin style, with questions for up to two hours. Then you break off into small groups for a group task/activity to evaluate your performance. You never know when it's going to end. And worst of all, you won't know if your interview will be a group interview or not, untill you show up. ALL of these unknowns cause anxiety and leads to a poor interview performance. And that's why I'd like to introduce you to my secret weapon for acing any group interview. It’s called Group Interview Guru! And there is nothing like it anywhere, because its designed from actual group interviews, from real companies all over the world. I’m able to take you behind closed doors so you can touch, feel and see what real group interviews look like, and then get my strategies and advice on how to navigate your own group interview. Use for: Group and panel interviews. The guide is designed to prepare you for ANY type of group or panel interview in the following areas: Finance, government, management, administrative, IT, sales, engineering, accounting, manufacturing, medical, non-profit, teaching, customer service, and everything else. How Does "Group Interview Guru" Work? First, I’ll give you a detailed introduction to group interviews so you can understand why employers use them. Then I’ll show you all of the personality traits employers are looking for in candidates, and how you can BE the perfect candidate. You'll get my 3 stage group preparation strategy. I’ll show you EXACTLY how to prepare for your group interview. I’ll show you how to map out a winning strategy that you’ll use during your interview. I’ll show you what to do after a group interview. By this time, you’ll have a solid understanding of the candidate you need to be to ace your interview. I’ll break down the 5 main styles of group interviews, teach you how to act in a group interview, and give you four key strategies you need to win the job. After all that, then I’ll walk you through 13 real world group interview exercises from companies like Apple, Yahoo, Chase Bank, Macys, online retailers, automotive companies, and more. You’ll get to see firsthand what group interviews look like for sales jobs, retail jobs, managers, graduate roles, mechanical engineers, customer service, IT support positions, marketing and more. By this time, you’ll not only have a solid understanding of a group interview, but you’ll feel like you’ve been on 6 or 7 of them yourself, and you’ll be well prepared to handle any type of situation, even if you’ve never been exposed to it before. And that’s the real power in Group Interview Guru. I'm Giving You Over $50 in Bonuses! All of the bonuses have been added to a special version of Group Interview Guru, so you only need to download one guide. If for any reason, you don’t love every page in this book, I’ll refund your entire purchase. If you have a group interview coming up, try Group Interview Guru. Put it to work for you. If it doesn’t deliver for you like I promised, I’ll refund your entire purchase, no questions asked. If you’ve used some of my other products, then you know I only make good stuff, and Group Interview Guru is no exception. But I’m so confident you are going to love this program because it’s going make you the smartest candidate in the room. If you have a group or panel interview coming up, then I want to help you ace it. Let me ask you this, have you ever used Google Maps or GPS to get directions to go somewhere? This is the same thing; its like GPS for group interviews. This program will teach you how to prepare yourself for the toughest group interviews and put you in a position to rise above your competition and naturally attract employers. The truth is, if you have a group interview, you need a strategy to navigate the interview, or you’ll feel like you’re in complete darkness without a light. Group Interview Guru is your light. You'll learn everything you need to know about passing a group or panel interview. From the early preparation stages, to winning strategies, to an inside look at a complete break-down of what goes on in a group interview. You’ll be armed with powerful, insightful, strategies that will allow employers to visualize the strength, leadership, and passion you’ll bring to the job. I guarantee you’ll walk into that interview with a feeling of confidence that no other candidate has and you’ll naturally elevate yourself to a position of authority and make their hiring decision easy. Try Group Interview Guru today. Put it to work for you. If it doesn’t deliver like I promised, I’ll refund your entire purchase. PS - Just imagine the power you would have over your competition if you had advanced knowledge of group interviews? You would always be two steps ahead of everyone and employers would see you as creative, trustful, decisive, and adaptable. They are going to be amazed with you. They are going to love you. They will want to hire you. That’s what Group Interview Guru is going to do for you. You’re going to love it. PSS - Group Interview Guru is like no other program that exists, anywhere. It's truly a deep-dive into the inner workings of group interviews. Group interviews are a new form of interviewing and there is very little information about them. The ideas, concepts, and techniques in this book are designed to get you well-prepared for any group interview so you come across as the smartest candidate in the room. 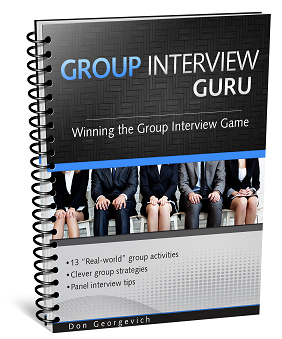 You won't find the strategies, concepts, and techniques I'll share with you in Group Interview Guru, anywhere else. With all my products, you have my personal 100% satisfaction guarantee that if you don't like it, I’ll give you your money back. Grab your copy of Group Interview Guru today!